Eloquent is a powerful Laravel ORM, and it allows to define relationships pretty easily. But do you know all about its functionality? Let’s check it in this ultimate guide, which will cover all types – one-to-one, one-to-many, many-to-many, and polymorphic relations. In addition to the article, each section will have a mini demo-project with link to GitHub and video explanation. Let’s start with basic database theory, almost unrelated to Laravel. 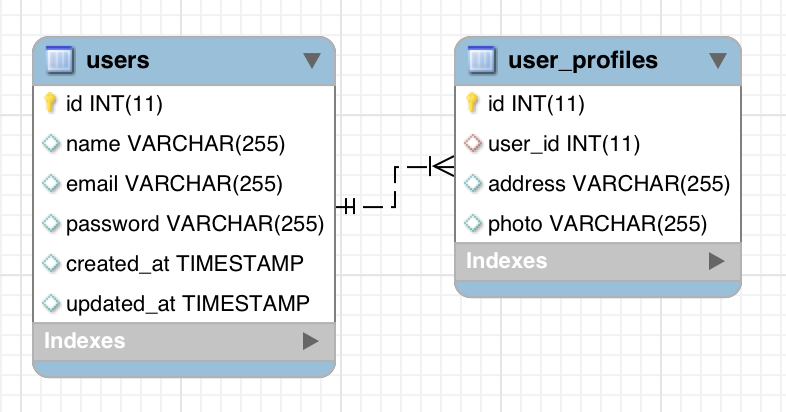 In this example we’re defining posts.user_id field with foreign key to users.id field. Important thing: we also may specify the behavior for the delete and update actions on related tables. In other words, if we delete a user, what should happen to their posts? Notice: there are more options but they depend on database system and settings. Ok, enough database theory, let’s go to the first type of relationships. We will take a look at the most often example – when User has a Profile but they are in separate database tables. In Laravel it would work with models User and UserProfile. Let’s see how it’s defined. As you can see, we have hasOne() method with only one parameter – related model’s class name with namespace. Laravel automatically “knows” that there is a relationship on main table’s id field and related table’s user_id – it is formed by main table’s name, putting it to singular and adding _id. But if in your case fields are different, you can add them as parameters. So second parameter is a related table’s field name, and third parameter is a main table’s field. With our relationship defined, we can use it like this. On the other hand, we may also have a relationship from UserProfile to User model, a reverse from hasOne. This one is called belongsTo. Relationships help us not only to view information in a convenient way, we can also manage it. But there’s a shorter way to attach a profile to the user – there’s no need to define user_id field manually. It’s really convenient to have these relationships defined and then only access data by calling parent or child object. But it’s not that simple – you may bump into performance issues. It will work ok, but under the hood it will perform many SQL queries. This code will be executed like this: “For each movie record please give me the director”. So one additional query for each movie. And if you view the table with 100 movies, it may significantly impact the page load. To avoid that, you can load the relationship data within one call – it’s called eager loading. See the with() function here? This will perform only one additional query for all movies. There are more usages for eager loading, which we will discuss for more complex relationships. Generally talking about performance, I always advice to have Laravel Debugbar package turned on locally, and to check Queries tab. Here’s a short video with demo project I’ve made. The next type of relationships is one-to-many. It is used when entry in one database table can have many related entries in another table. In fact, one-to-many is really similar to one-to-one, you will see now. We take a popular example: Books and their Authors. So every book belongs to one author, and one author can have many books written. Same as one-to-one, Laravel automatically “knows” that there is a relationship on main table’s id field and related table’s author_id – it is formed by main table’s name, putting it to singular and adding _id. Again, as in one-to-one case, you can override the default fields with additional parameters. Inverted function of a belongsTo() is called hasMany() and is defined in the parent’s model. Also we can use relationships to create the data, not only query it. Let’s imagine we have more than one level deep. So one Author has many Books, and each Book has many Chapters. The result will contain all chapters for every book, which you can loop through, without any additional SQL queries. This is where real power of using relationships shows benefits. And it’s not only about querying outside of the relationship. You can define additional clauses in relationship itself. For example, you want to have separate relationships to books and published books. Basically, relationships open a lot of possibilities to avoid writing pretty complex SQL queries, just by using relationships, and it also makes the code more readable. Another sub-type of relationships allow you to go more than one level deep, it’s kind of a has-many within has-many (yes, “Inception”). * Get all of the chapters for the author. This will allow us to access the chapters like this: $author->chapters. In this chapter we will talk about more difficult concept of many-to-many relationships, also pivot tables. This structure is used when one entry from table X can have many entries from table Y, but also the other way around – Y may have many entries in X. For that, we need a separate table that links both X and Y via foreign keys. Official Laravel documentation takes the most common example – a user can have many roles, and a role can have many users. But we will take another often-used example – Posts and Categories. So each post can have one or more category, and each category can have one or more posts. As you can see, the middle table (called pivot table) has only two fields – foreign keys to both tables. Then, basically, we can query all the categories by the post, and vice versa. To use that effectively in Laravel, we need to define relationships with belongsToMany() function. Since there is no parent or child table here, relationship can be defined in both models, depending on what you would need to query later. 1. Pivot table name is a lowercase singular form of both tables, ordered alphabetically and divided with “_” symbol. So it should be category_post (not “categories_posts” and not “post_category”) or “role_user” (not “roles_users” and not “user_role”). 3. There is no need to define a separate model for pivot table, you don’t need to create CategoryPost.php model. And that’s it – function attach() accept the ID and saves the data. There is one more function toggle(), it will invert the presence in pivot table. All the IDs here will be inverted – attach what wasn’t attached, and then detach what was attached. There are cases where you want more information for the pivot table. Like, for example, timestamps – which in Laravel is represented by fields created_at and updated_at. And now you need to capture the logs of every action on any table. With Model Observers, for example. So one field for each table – it may be post/image/category. But what if you have dozens of tables? It’s not that convenient to have many fields in the logs then. Here’s where polymorphic relations help. So these two columns loggable_id and loggable_type are the most important. loggable_type column will contain the class name of the related model – in our case value may be App\Post, App\Image or App\Category. * Get all of the owning loggable models. * Get all of the post's logs. * Get all of the image's logs. * Get all of the category's logs. Notice that there’s no direct foreign key in the database – relationship is kind of “artificial”. If you don’t like storing full model path in loggable_type field, instead of App\Post you can save only post, but you need to define the “morph map”, attaching those models to your strings. Yes, these relationships can also be many-to-many. Imagine this scenario: DB tables posts, pages and categories. And you need to attach categories to either posts or pages. And you would have to create two separate many-to-many tables, right? * Get all of the categories for the post. * Get all of the posts that are assigned this category. * Get all of the pages that are assigned this category. So, that’s all about Eloquent relationship for now. Any questions? Anything to add? Please add to the comments. The best article about Eloquent relationship! Great insight into the fuzzy world of eloquent. I have a peculiar situation where I have ‘courses’ and ‘students’ tables with a pivot of ‘course_student’. In the pivot table I was able to successfully add additional columns ‘enrolled_at’ and ‘grade’. Now I want to COUNT(*) students enrolled for a course and groupBy(YEAR(enrolled_at)). I’m kinda stuck with writing the right query. I haven’t been able to test this, but it should set you on the right track for doing what you need using Elequent. Lou’d end up with 2 profiles woudn’t you? I watched few video tutorial about Polymorphic Relations – now finally I understand it!